One of my first jobs in the design industry involved the ancient art of cutting color for print production. It was a horrid job but it paid really well so it was my job for 2 long years . 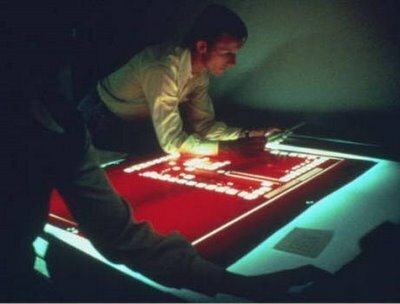 The process for those of you that don’t know, involved placing sheets of Rubylith or Amberlith on top of a black and white negative the size of a newspaper spread. Then on a light table, you would take and Exacto knife and cut away the sections that would have color ink applied. After you would add screen values to the open areas to determine how much colored ink would go in that spot. This was done for each color (Cyan, Magenta, Yellow, and Black). When it was all done you shot another final negative on a copy camera with your “Stripped” film in place. All of this was done after you had spent hours pasting-up your original page spreads, and shooting negatives of them on a copy camera. The whole process was tedious and it ruined your eyes. Well it ruined mine. I had perfect vision before, I have been slightly nearsighted ever since. So what is the point of all of this? Well this week I got new eyeglasses, and I love the packaging they came in. 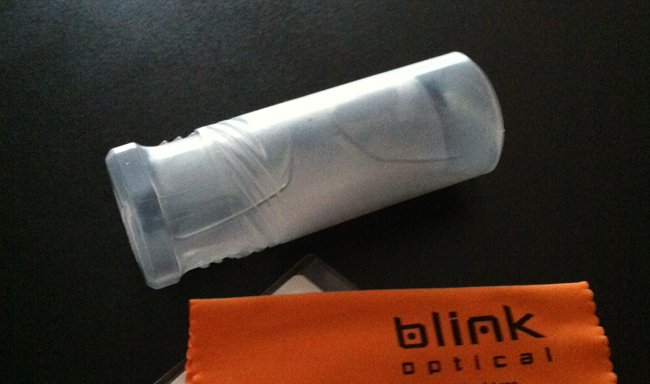 When I first opened the box my glasses shipped in, I was greeted with a frosted crush proof plastic tube. The tube held my glasses, a cleaning rag, and documentation for the frames. IC! 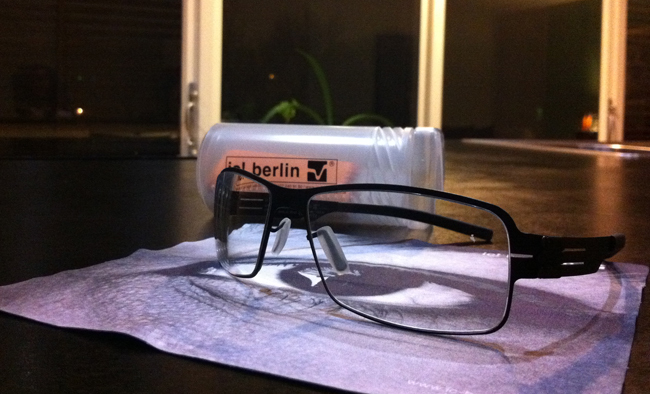 Berlin had eliminated the traditional glasses case knowing that 95% of all glasses owners do not use the case that their glasses come in. This move allowed the designers of the packaging to take a whole new approach to how they delivered the glasses, and reduce the carbon footprint needed to get them to you. The case is a simple tube. The top literally screws to the bottom with a twist off sleeve that doubles as the cap and adds structural reinforcement to the package as the ribs of the closing mechanism create additional structure to the shape. 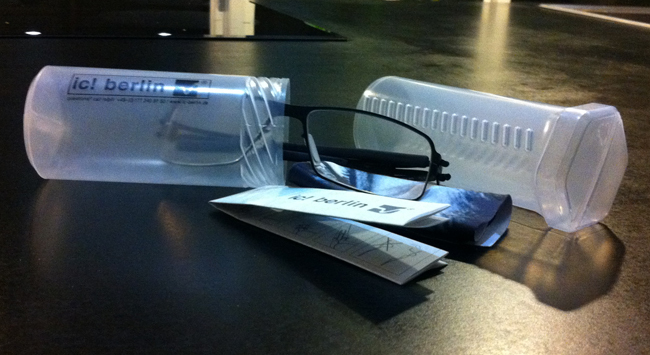 The result is a double walled sleeve that holds your eyeglasses. The package is very simple, with te IC! Berlin logo screen printed on the side. Nothing fancy, just simple ingenious packaging that uses fewer materials than a traditional case, costs less to ship due to reduced weight, and is 100% recyclable. Frankly I think this is a much better solution than the last three or four pairs of glasses that I have bought. Each one of those came in lager box, one that would accommodate the eyeglasses case. Each one of the cases was usually some form of plastic wrapped box that was lined with some polyester material, that held the glasses and paperwork. I have one case left from my previous pair of frames for reference so I can’t give an accurate materials list. The case for my last frames though is a fairly complex plastic over-wrap box with embossed surfaces, and chrome hinges. It couldn’t have been cheap to produce, and the case itself weighs in at 4 ounces which adds overhead to the shipping. So hats off to you IC! Berlin for a better solution. I have no idea if their intention was to reduce materials and create a more green solution to their packaging. Either way, they did. Posted in Packaging and tagged Eyeglasses, IC! Berlin, Packaging, postaday 2011, postaday2011 on February 26, 2011 by Author.